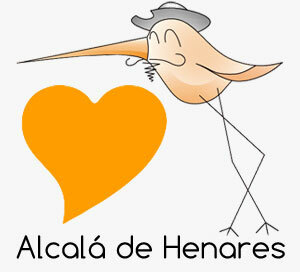 Did you know Alcalá de Henares is well-known in the surroundings because of its sweets? 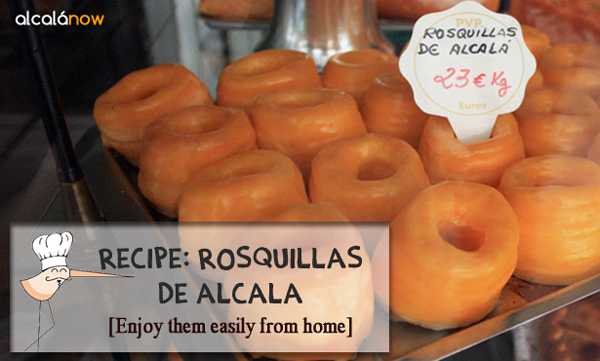 The most famous ones are the ‘Rosquillas de Alcalá’. Have you ever tried one? You really should. Rosquillas de Alcalá have the shape of a doughnut but are made with puff-pastry and bathed in creamy yellow egg yolk and sugary glaze. Yummy! While you are in Alcalá, you can buy them in any ‘Pastelería’ in the city. You may even get in love with them and eat them every day. But… What are you going to do when you’ll be back in your hometown? How will you survive without this tasty treat the rest of your life? The solution is that you make them yourself. Don’t get scared, they are super easy to make, especially if you buy some ready-to-bake puff-pastry in a grocery store or supermarket. You can also make it from scratch (learn how to do it in this video). Spaniards usually buy it and is something easy to find frozen or refrigerated in Spain, you should ask for ‘masa de hojaldre’. Once you have your pastry ready, fold the dough twice, because you need to create a 4 layered pastry. Then press just a little with your rolling pin so they stick together. Now we need to cut the dough with two circular cutters, one big and one smaller, so we get a doughnut shape. Use whatever you have at home, maybe some circular cookie cutter and a plastic cap of a Nestea bottle. Then bake it at a temperature of 200ºC (212ºF) till it rises and browns. The second step is the yolk cream. We need 4 yolks, 80gr (1/3cup) of water and 240gr (1cup) of sugar. Boil the water and the sugar until it gets syrupy (3 minutes approximately when it comes to a boil). Allow it to cool down for a couple of minutes and stir the syrup slowly in the eggs with a whisk, avoiding that the yolk cooks. Boil the mixture again and keep stirring for 5 minutes until it becomes thick. Allow it to cool for 5 minutes. Dunk the baked pastries in the yolk cream and lay them on a cooling rack. The final step is a glaze. Mix 35gr (2 tablespoons) of water with 200gr (1,5cups) of confectioners’ sugar. Dunk the pastries in it and lay them on a cooling rack again until they dry. Enjoy! The original recipe and photos are in here. Thank you Mabel!